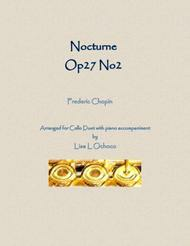 Composed by Frederic Chopin (1810-1849). Arranged by Lisa Ochoco. Romantic Period, World, Wedding. Score, Set of Parts. 17 pages. Published by Lisa Ochoco (S0.22691). Chopin definitely wrote some beautiful pieces for piano. 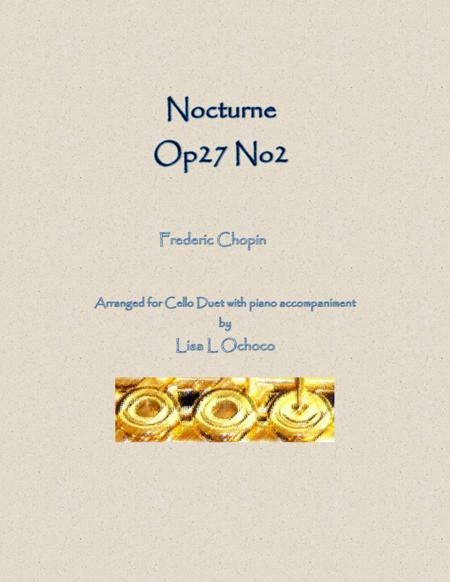 This Nocturne is my favorite and it lends itself well as a cello duet piece with piano accompaniment. This arrangement is for the advanced cellist duo who play as one. I hope you will enjoy playing this piece as much as your audience will enjoy listening to it.